10 degrees below zero. That’s what it said on the thermometer outside my parent’s picture window this February morning. I was half tempted to crawl back into bed but everything I had read about coyote hunting said that the morning after a very cold night was a morning to head out. Once the jeep was loaded with rifle and electronic caller I headed out to my “Hot Spot”. I was very optimistic for a first time hunter, the videos made it look so easy. Just find an area with coyotes, sit down, turn on the caller and wait for him to walk into range. Seemed simple enough. I soon arrived at my first spot for the morning. I parked the jeep about 400 yards away so I wouldn’t spook anything and quietly walked in. Once I found a suitable tree to lean up against I got my rifle into position overlooking a clearing for some power lines. I then got my caller pointed in the right direction and turned on the rabbit squealer CD. It didn’t take long; about 20 seconds into the CD the sky above me came alive with Black Bandits. I didn’t know what to think, here I am trying to call in a coyote and all I saw were noisy, angry crows. This went on for the next 10 or 15 minutes until I finally gave up and walked out. As I was walking back to my parking spot all I could think about was what I did wrong. They never talked about this in the predator hunting videos. All they ever saw were coyotes, fox and bobcats. Instead I get crows. This same scenario repeated itself 4 more times that morning in 4 different areas. Walk in, sit down, turn on caller, and get bombarded by crows. Now I know how Tippi Hedren felt in “The Birds”. That was my introduction to coyote hunting and shortly after that I turned my attention to Crows. I figured if they were going to keep interrupting me I might as well carry a shotgun instead. Fortunately Crow hunting is a lot easier and a lot more productive. I already had all the necessary equipment; I just had to put it all together. Being successful at shooting crows is all about location. You just can’t set up in the middle of some field and expect them to come flying in from all directions. If there aren’t any crows in the area you are going to spend a lot of time doing nothing. Scouting for shooting areas is quite easy; all it takes is some driving around until crows are spotted. Make note of the location and the time of day and store it away for a later date. If the opportunity presents itself you can park out of sight of the birds and try calling them in then. You want to pick an open area without any tall trees. Crows won’t go out of their way to swoop in below tree top level. They will stay above the tree tops and out of range to see what all the commotion is about. Find an area with smaller trees that you can use for cover and your success rate will improve two fold. Most of my crow hunting is the “run and gun” method. I have an area pre-scouted with about 6 different calling spots along the way. I will stop at each one and call for about 5 to10 minutes. If nothing comes in I will move on to the next one. If they are in the area it usually doesn’t take long. If they are really close it can happen in the first 10 seconds. Once I shoot a crow in a specific area I will leave that spot alone and wait until the following weekend before I hit it again. Crows figure things out pretty darn quick and they will get gun shy faster than any bird I know. 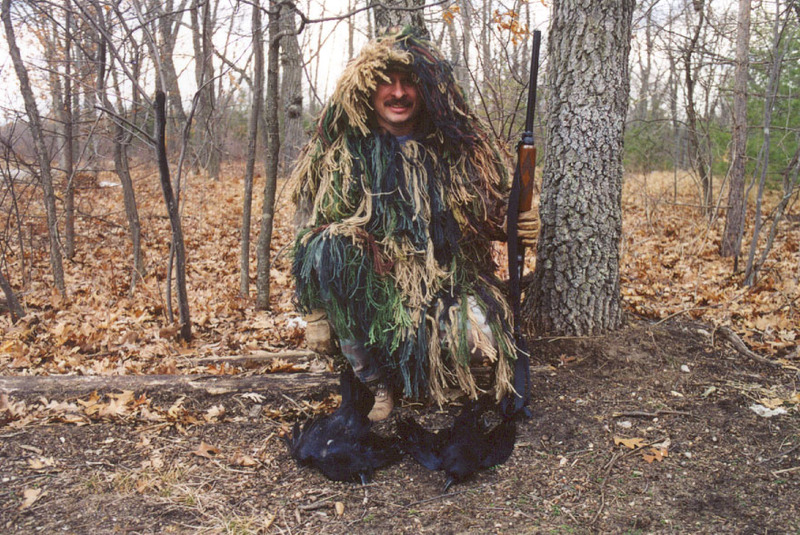 Getting started on crow hunting takes a minimal investment on equipment. Most hunters already have everything they will need to start. All it takes is a shotgun, a few shells, a cd player and calling cd and camo. For the beginner an actual predator caller is nice but not necessary. If it plays a cd or tape and has speakers it will work. Just point the speakers up and turn up the volume. As for what type of calling tape I prefer a crow in distress or crow fighting sound. Both seem to work pretty well for me. Crows are the bullies of the avian world and they love to pick a fight with just about everything. If they hear another crow in distress they will usually come charging in to help out. Once that happens you have to be quick. Your favorite shotgun along with some target loads will work nicely. A crow, body wise, is not much bigger than a pigeon. They just look bigger because of the wings. It doesn’t take much to bring one down and a well-placed load of #8 shot will do the trick. I like to keep my shots close so my O/U 20 gauge with an IC/Mod choke combination works quite well for me. In order to get them close good camouflage and keeping still helps. It’s just like duck hunting, if you move to quickly or look up at the wrong moment the birds will flair and you will be hard pressed to get them back into range. Once a crow thinks something is wrong he will stay out of range and fly circles around you until he gets bored and flies away. Sometimes you can get away with not having any camouflage but if you already own it, wear it. A couple of standard decoys will help lure them in as well. I like to set one up on the ground near the caller and another in a small tree or bush if I can. It isn’t always necessary but it certainly does help. I can’t stress this enough. When using a call, especially one of a rabbit squealing, just about everything within earshot is going to come check it out. I have had owls, hawks, cats, dogs, a bald eagle and lord only knows what else come in to see what was making all the noise. The last thing you want to do is make a mistake and rise up to shoot at a hawk. Where I hunt in north east Michigan the other problem is Ravens. Ravens are protected and there are a lot of them in my area. They look almost identical to a crow except they are bigger and their tail has a “V” shape to it. Their call is also more guttural and not as high pitched as a crow. It doesn’t take long to spot the difference between the two so err on the side of caution until you are sure. The best time to hunt crows is when they are in season. Morning, evening, middle of the afternoon, it really doesn’t matter. Crows fly around all day. My home state of Michigan has a 120 day season that is broken up into two parts. The first season starts Aug 1st and runs until Sept. 30th. The second season starts Feb. 1st and runs until the end of March. Check your local game laws to see when the season is for your state. Each season had its advantages and disadvantages. The early season means first year birds that have never been shot at but it can also mean 90 degree humid days with mosquitoes. The later season the birds are smarter but food is also a little scarcer. That first spot I mentioned in the beginning was holding so many crows because there were a couple of deer carcasses nearby. If the deer had not been there I doubt the crows would have either. Well there you have it, crow hunting in a nutshell. All that is left is to go out and give it a try. 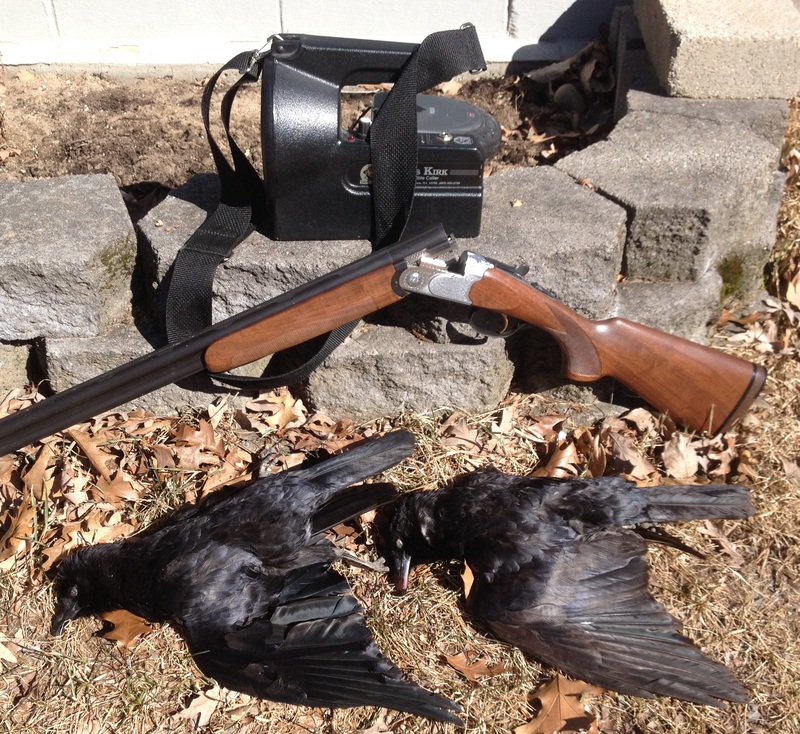 Crows do make for some excellent wing shooting and they also make an ideal hunting experience for a young wing shooter. Just remember to be careful and have fun. Oh, one other thing. That first spot I mentioned? I went back there right after dinner with a shotgun instead. There are two less crows to attack me the next time I stop by.